CD85d (ILT4) is a member of the new immunoglobulin (Ig)-like transcripts (ILT) family of genes located on human chromosome 19q13.4. ILT4 is also known as leucocyte Ig-like receptor (LIR)-2 and monocyte / macrophage Ig-like receptors (MIR)-10. ILT4 is a transmembrane protein recognized by 42D1 monoclonal antibody. The protein has extracellular Ig-SF domains, and ITIM motifs in the cytoplasmic tail that inhibit cellular responses by recruiting phosphatases such SHP-1. ILT4 is confined to the myelomonocytic lineage as it is expressed on monocytes, macrophages, and dendritic cells (DCs). ILT4 binds to HLA-G molecules with a 3- to 4-fold higher affinity than to classical MHC class I molecules. ILT4 may modulate one or several of the antigen presenting functions mediated by DCs, control inflammatory responses mediated by monocytes / macrophages or inhibit their cytotoxicity. The recognition of HLA-G by ILT4 may play a role in materno-fetal tolerance as HLA-G is selectively expressed in the trophoblast. 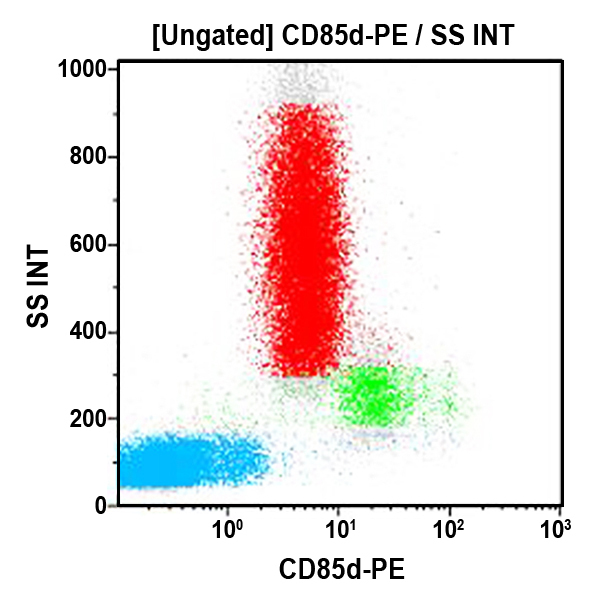 It has been shown that recipient’s CD8+CD28– T suppressor (Ts) cells may induce tolerance by up-regulating ITL3 and ILT4 expressions in donor’s dendritic cells, rendering these antigen-presenting cells (APCs) tolerogenic.